During the first half of September the harvest was finished. Favourable weather conditions i.e. enough precipitation in June, July and at the beginning of August without any extreme temperatures, supported very good hop growth, flowering, creation of cones and ripening. The health state of hops did not worsened in September and remained at the same level as in August. It varied between very good and bad depending on localities with downy mildew of hops. Especially vegetation near watercourses, in valley locations and places with morning fogs has been damaged. The appearance of pests did not exceed harmfulness limit anywhere. Majority of the farmers started the harvest between 18th and 20th August. At the most of the hop farms the harvest was finished in the first decade of September. Top Hop farms used in total 24 combers for hop harvest and 10 kilns for drying of hop cones. Saaz Hop harvest at Top Hop farms was finished till September 12th, harvest of the variety Sladek till September 18th. Size of hop cones was uneven; there were localities with smaller or on the contrary bigger cones. 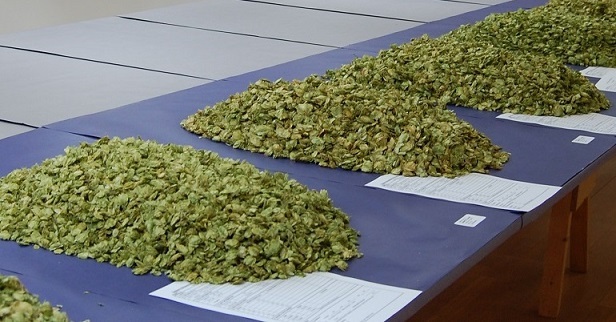 The yield of Saaz semi-early red bine hops exceeds the results of the crop 2015 and can be classified as satisfactory. Alpha acids content is estimated slightly above the long-term average. However there are differences among individual hop gardens.